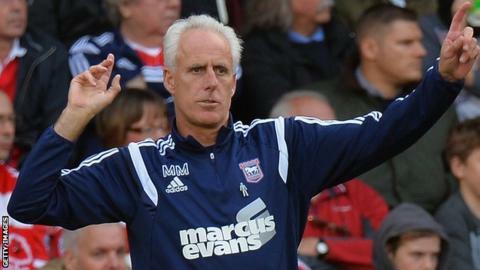 Manager Mick McCarthy has described the Championship as "ridiculous", with his sixth-placed Ipswich side as close to the automatic promotion spots as they are to Tuesday's rivals Fulham in 17th. Saturday's win over MK Dons moved Ipswich back into the play-off places and to within nine points of second. McCarthy says a "whole lot" of sides are play-off hopefuls, with Leeds and Fulham eight points off the top six. "There are not many point in it either way. It is just ridiculous," he said. Talking to BBC Radio Suffolk, the 56-year-old continued: "I've seen it in the past, if a team in 14th puts three or four wins together, suddenly you are on the back of the play-offs and momentum can take you anywhere." The former Republic of Ireland boss has previously called England's second-tier competition "bonkers" for its unpredictability. Last season McCarthy guided the Tractor Boys to the play-off semi-finals, going out to East Anglian rivals Norwich City, who went on to win promotion back to the Premier League. Ipswich Town, unbeaten away from Portman Road in four games, will be looking to extend their winning run to four games when they travel to Craven Cottage.